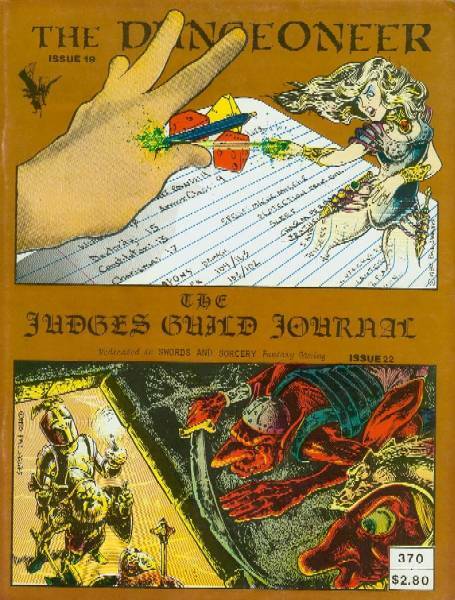 A 64-page issue dedicated to the winners of the Dungeon Creation Contest: 22 prize winning Dungeon Levels, with maps, are featured. 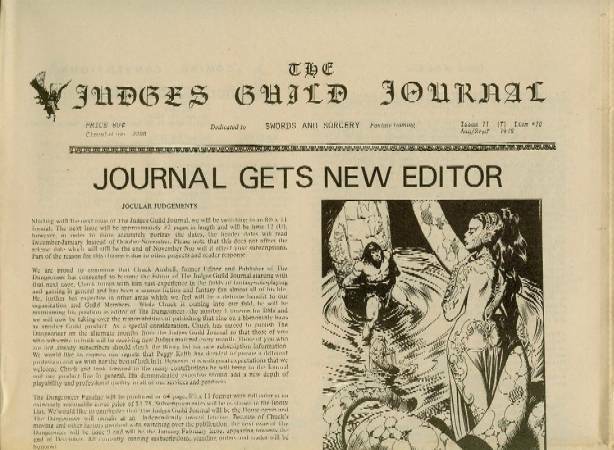 Also included in this issue are the rules for the Judges Guild Journal Son of the Worlds First and Greatest Dungeon Creation Contest and new staff introductions. 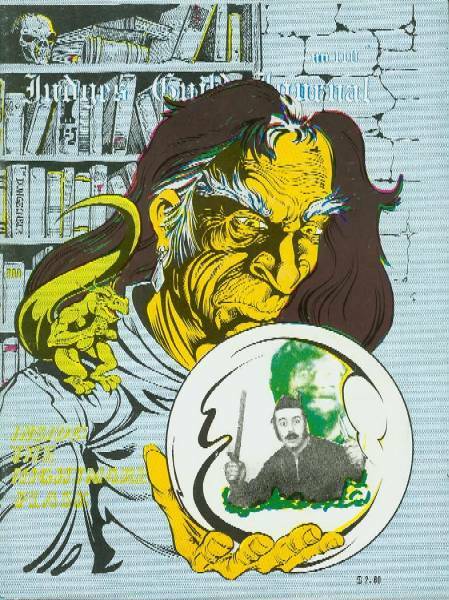 Cover art by Buz, Back cover by Aaron-Arocho and Chuck Anshell. A 32-page magazine, cover by Aaron Arocho. 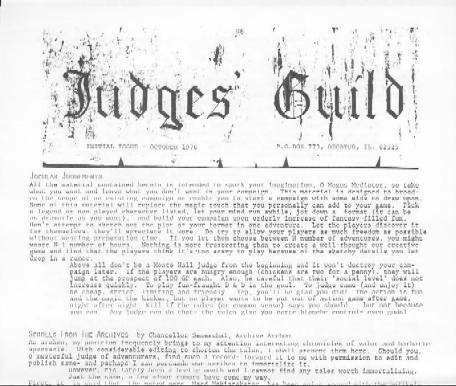 More contest winning dungeons, and new contest - "The Judges Guild Journal Son of the Worlds First and Greatest Dungeon Creation Contest". Contest (tJGJSO-tWFaGDCC-C) announced. Dave Petrowsky gives tips about collecting and painting your miniatures in his "Ancients Column". Greg MacKenzie's two strips "The Misadventures of Erroneous Grog" are included, and Steven Huff has "Omnicient Opinions". A 32-page magazine, with front cover by Aaron Arocho and back cover by Aaron Arocho, with color by Byran Hinnen. Instructions for making authentic looking Rune Scrolls is Bryan Hinnen's "Rune Scrolls and Translations". 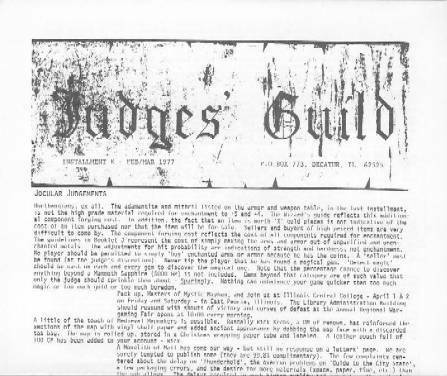 An errata sheet for Of Skulls and Scrapfaggot Green is included. Mark Holmer's "Designer's Notes" are valuable for Wilderlands of the Magic Realm. Rusty Lamont offers a comic page. 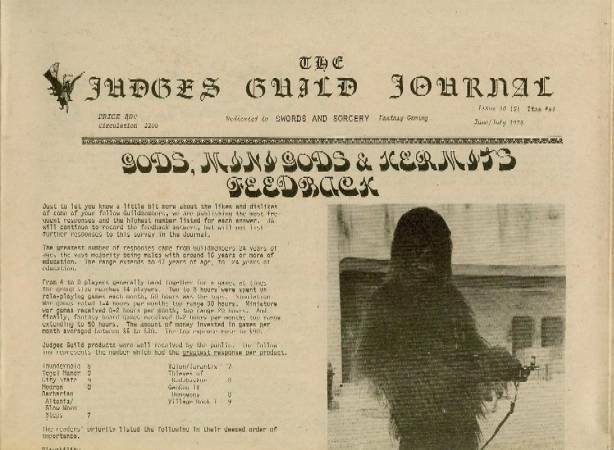 A 48-page magazine, front cover by Buz and back cover by Paul Jaquays. 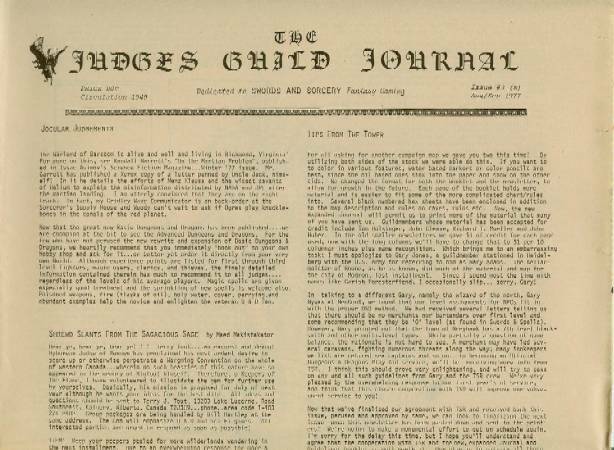 This issue features David Petrowsky's "Ancients Column". Reverend George Blank's first of a series of articles entitled "Creating Good Computer Games". Bill Paley tells how to create your predatory monsters in "Planning Ecology". Mark Holmer reviews "Fantasy Music". Eric Olson gives Power tables for Magic creation in "Random Magic", and Robin W.Rhodes give tables for spells in "Systematic Magic", and Steve Huff gives tables for naming characters. 80-pages, cover by Paul Jaquays. This magazine features more "Prodigious Platemail". David Petrowsky's "Ancients Column"; dealing with the Gauls of France and Germany. Survival of the Fittest, explanations and map by Michael Mayeau. "G Modules" by Richard Forster relates his experiences with TSR modules. 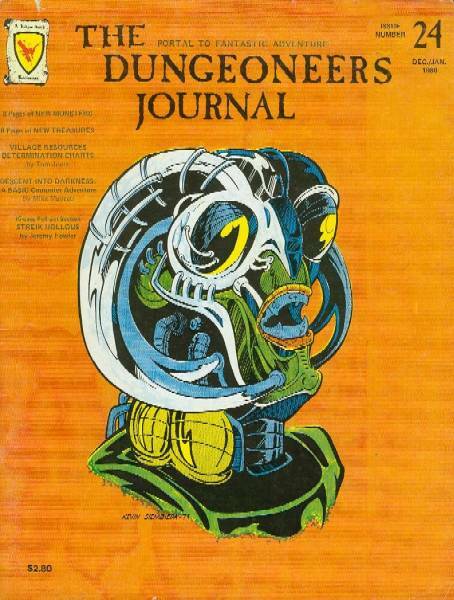 Ronald Pehr's 6-page article "Encounters in D&D" contends encounters between monsters and players are too mechanistic, and gives personality traits for characters. Reverend George Blank's "Writing Good Computer Games", part 2 of this series discusses writing and marketing. Dean A.Kunigisky presents "A New Character Recording System", Bill Paley provides background on the General of the City State; two separate intelligence networks in the World Emperor's City State. "The Escaping of Monsters and Traps" by James Ward; advises us to invest our extra treasure in stores, armor, and helpers. "Thieves, Two Views" by Bill Paley encourages enthusiastic and creative theives. 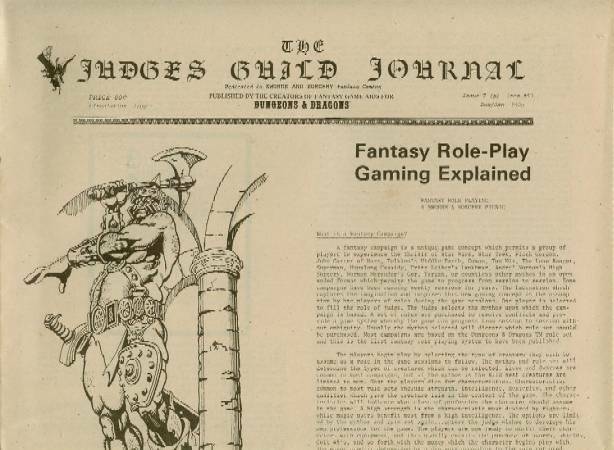 Dungeon contest winners, and several winning dungeons are printed in this issue. A 64-page issue, cover by Kevin Siembieda. Bryan Hinnen, "The Wilderness Project"; First installment gives background on The Mines of Custalcon. Dave Petrowsky, in the "Ancients Column" details the ancient world leaders of 3500-323 BC. A 6-page adventure by Phillip Brewer is "The Nightmare Flask". Bill Paley's "Malevolent Character Modules" describes the offspring of the Overlord of the City State. "The Adventures of Antionne De Rabbierre" by Bob Hennelly, a two page adventure. Possible mishaps and perilous encounters are described by David Dougher in "From Tavern to Dungeon: The Long-Forgotten Trek". "Heraldry Tables" by Bill Paley makes shield devising easier. "Zantius" is a complex campaign in a medieval society, by John Lind. Brian Wagner presents "Martial Artists: A New Character Class". Paul Jaquays answers questions about Dark Tower in "Designer's Notes". 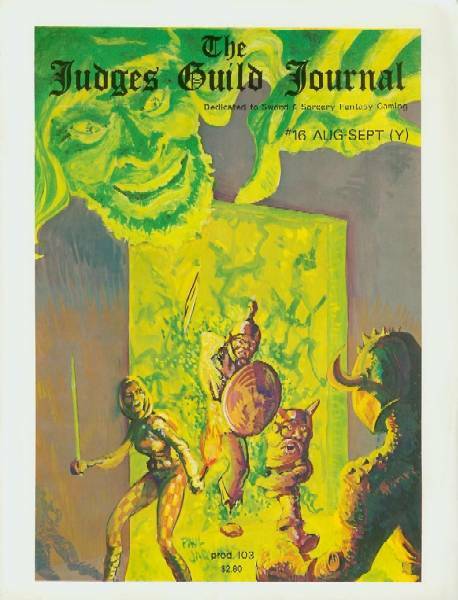 Announcing tJGJBo-tSO-tWF-aGDCC-C-C. A 21-page mini-dungeon by Steven Brandt is "The Mythos of Har". A 64-page magazine, cover by Aaron Arocho. This issue features "Venefics" by Thomas McCloud on a new class of Magic User. Mike Mayeau gives tables for random encounters in "Random Monster Tables". 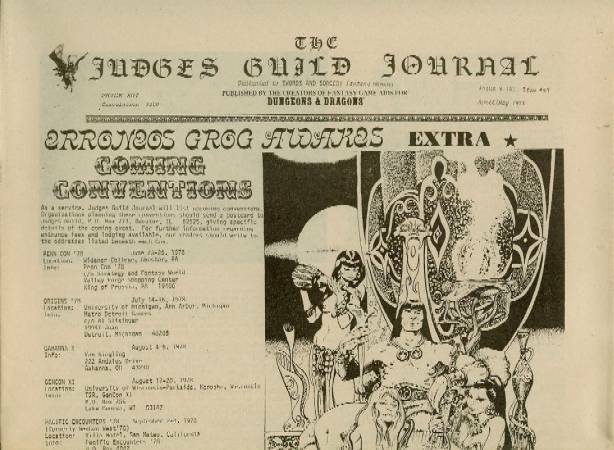 The Third Ultimate Dungeon Design Contest the Judges Guild Journal Bride of the Son of the World's First and Greatest Dungeon Creation Contest - Contest tJGJBO-tSP-tWFaGDCC-C-C is announced. A twelve page dungeon, "Dreaded Devil Den", is Jeff Martin's contribution. A 64-page magazine, featuring cover by Kevin Siembieda. "A Melee System" by Leonard Lakofka. A simple method of combat resolution with hit location. 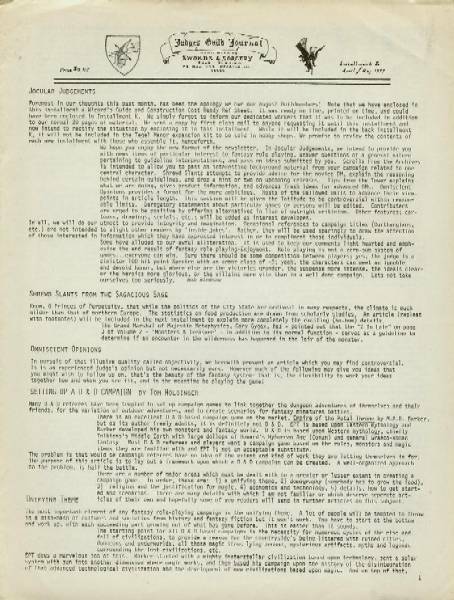 Brian Wagner's "Martial Artist's Errata". Bob Pryor explains social and cultural influences in characters actions in "Class Consciousnes". Geoffrey Tolle explains the difference between Witches and Druids in "Witches". Bill Paley offers tables to generate weird and different "Doors". "Who Cares If Magi Users are Equal to Fighters?" examines reactions and results in similar situations. "The Die is Cast" reviews Star Trek: The Motion Picture. Scott Fordyce's "An Adjusted Dexterity Table". Unified ratings for universal use is Robert K. Bingham's "A New Wargames Rating System". 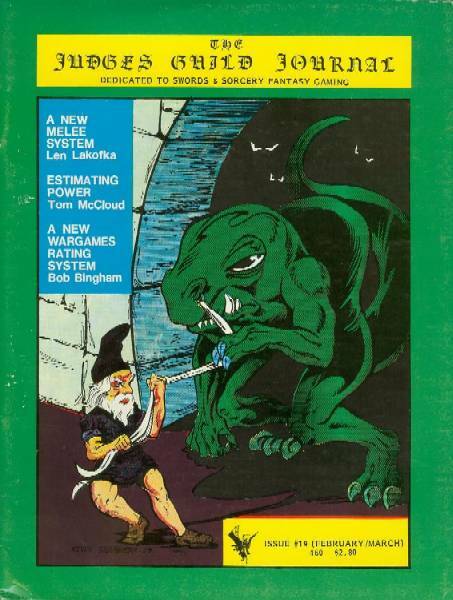 A five level dungeon by Bill Peschel is "The Dungeon Vlademor". "Lord Foul's Demondim Spawn" by Louis Soldano has new monsters derived from the fiction series Lour Foul's Bane. "Poisons: Types and Reactions" by David MacKenzie. "Falling Accidents" by James Maslanka, a damage chart, rules for unexpected encounters from behind is "Beating, Bashing, and General Muging" by Douglas Parker. Bill Paley presents a tongue-in-cheek "Players and Judges Flowcharts", and Thomas McCloud clarifies the number and level fromula in "Estimating Power". 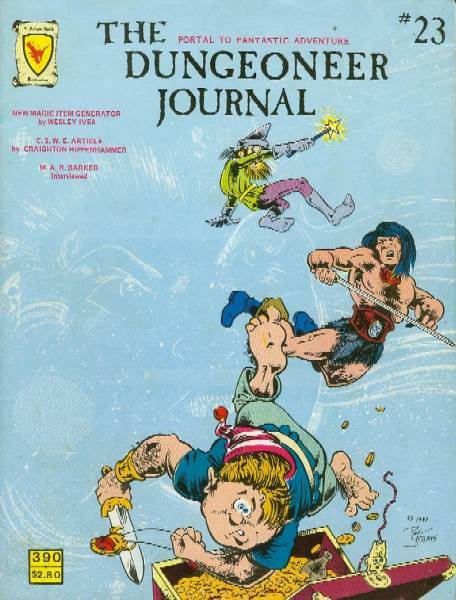 A 64-page magazine, cover by Kevin Siembieda and Bob Hadley. Featuring "Traveller Merchants: An Expanded Character Generation System" by Patrick Larkin. 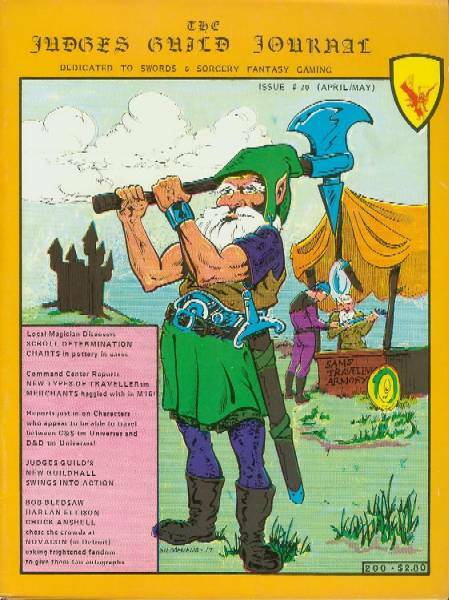 "Chivalry and Sorcery Conversion Tables" by Jack L.Webb, a complete conversion system to integrate ideas and weapons from C&S into an existing D&D campaign. 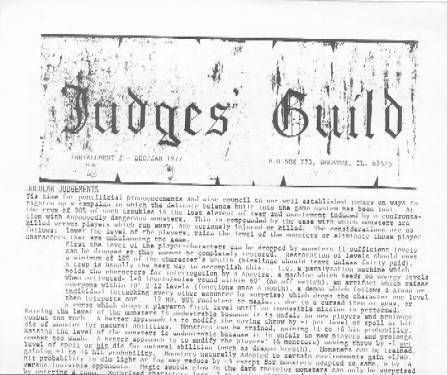 Dave Sering provides full details of the relationship of the Immortal City of Viridstan to other Judges Guild wilderness campaign. Robert Bowes "The Halls of Theorat" is a six level treasure filled dungeon. A 64-page magazine, cover by Aaron Arocho. Featuring a report on Novacon. Ronald Pehr's "A Day in the City State", the story of one Dwarf and his first day in our fair City. Bill Paley's "How to Cross a River Without Losing Half the Party" gives a few simple tips. For survival, a new serial by Thomas McCloud, "This is the Way Heroes Die". A table of monster attacks is Michael Dodge's "The Alternative Combat System". Adventures at Michicon are "Shrewd Slants From the Sagacious Sage". A tale of revenge by a "friendly" thief is Bob Pryor's "Call Me Friend". 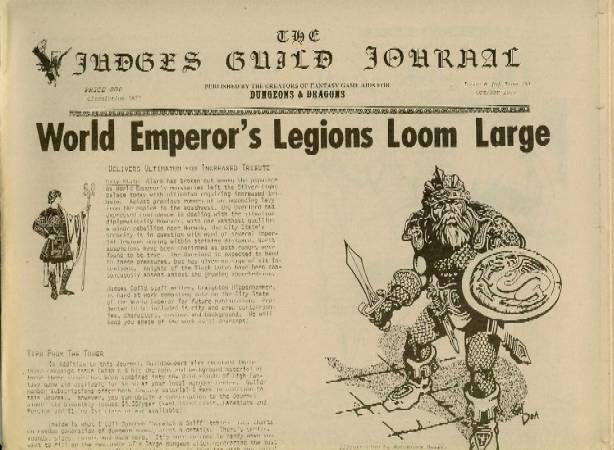 A group designed to instill fear into your players who insist on wearing plate armor is Bill Paley's "Fraternity For the Erradication of Armored Riffraff". A story, "The Black Prince", by Wilbur Ochiltree. Winners of tJGJBo-tSO-tWF-aGDCC-C-C are announced. The further adventures of our fearless hero is "The Misadventures of Erroneous Grog". 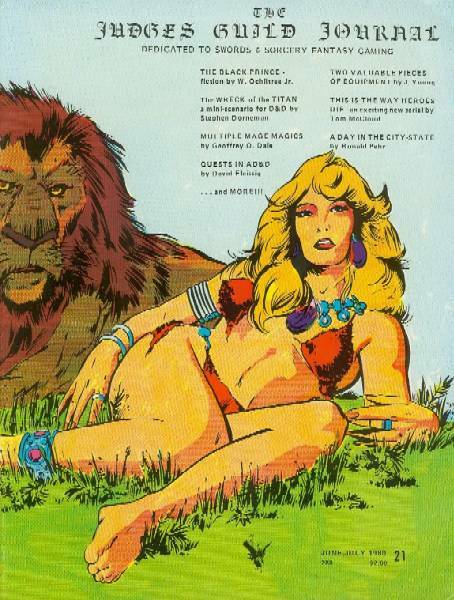 Suggestions for spicing up your quests is David Fleissig's "Quests in AD&D". Geoffry O.Dale supplies the means for you to form a chain of mountains, cause insect plagues, etc. in "Multiple Mage Magics". This month's adventure is "The Wreck of the Titan" by Stephen H.Dorneman, and Tom Jones has charts to individualize NPC parties in "Random Character Weapons". A combined issue, 64 pages long, cover(s) by Paul Jaquays. Features are: "Using Klutz Factors" by Kevin Fortune, concentrating factors, fun and fortune. A new Fighter sub-class for those who need a Bow or Sword to get anywhere is "Weapon Masters", by Kenneth King. Special tables for thos monsters that just aren't human are in "Critical Hits and Fumbles on Non-Humans", by Glenn Goddard. Lew Pulsipher chronicles new and mysterious "Dungeon Diseases". An unusual mini-dungeon is Geoffrey Tolle's "The Five Lens". "Jewelry" by Steve Marsh, tables for those who want to roll their own. A new character class is Steve Marsh's "Phoenixs". Thomas A.McCloud expounds on standard pack contents in "Mac's Packs". In "Adapting the Book of Demons"< Lewis Pulsipher does just that. Heredity effects on characters is "PC Parents" by Gary Foote. Steve Marsh gives a short dissertation on metals in "Metalurgy and FRP". Charles L.Evens nice set of tables for use in creating AD&D type solo adventures is "Dungeon Generator". Adding fantastic creatuers to your campaign is discussed by C.Lawrence Anderson in "Greek and Roman Myths". Bill Paley whispers "Rumors for Traveller". Steve Maarsh does "The Old Hill", a C&S adventures, and the Monster Matrix has six inhabitants. 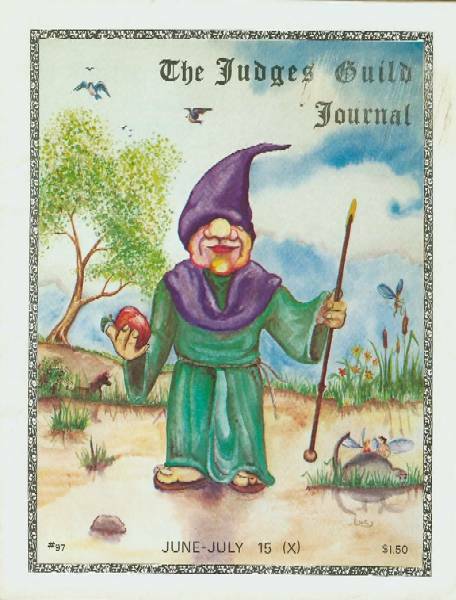 A combined edition, 64-pages long, cover by Paul Jaquays. 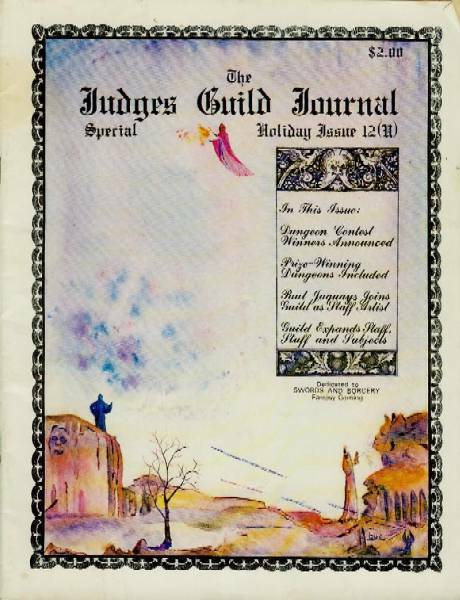 Features in this edition are: An interview with the creator and mentor of Empire of the Petal Throne, M.A.R.Barker; Douglas Putz suggest and addition to the movement of avian creatures in the wilderness; Alignment Gems by Tom McCloud; Craighton Hippenhammer elaborates on Judges Guild's City State of the World Emperor; a new slice and hack system by David Rechs; Tomb be or not tomb be... "Simpleton's Tomb", a mini-dungeon by Vic Mather; Matt Ring introduces four BASIC computer DM programs to help your judging; use a personal computer for your characters are explained in "The Mini-Computer in Traveller" by William Fawcett; Rudy Kraft helps explain the Runequest Combat System; the continuing tale of Princess Genesee and her never ending battle for truth and justice by Robert Fester; Life in the Elven woods, "Pereohel", a fictional story by Keven Paul Wichart (are all things Elven? 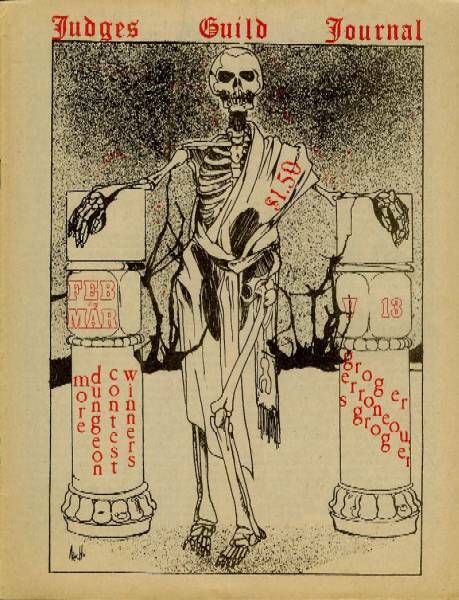 ); "Death Bell" by Todd Samost (it rings for thee...); "A Trip to the Underworld No.3" written by Bill Paley; Paul Jaquays discusses monsters and spells and miscellaneous things about Runequest in "Runeletters", and four new and interesting monsters inhabit the Monster Matrix. 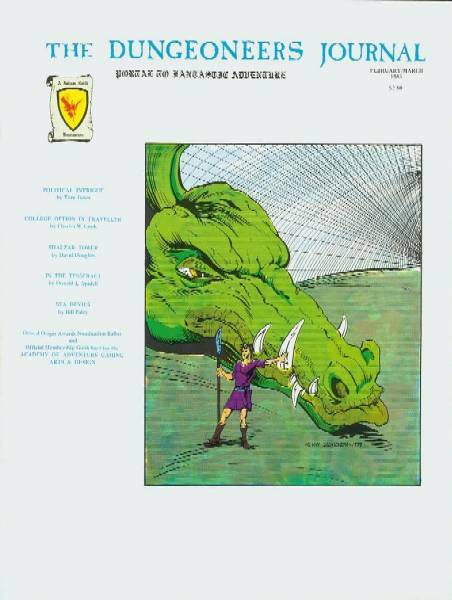 A 64-page magazine with front cover by Kevin Siembieda, this issue includes "Random Village Resource Determination Charts" by Tom Jones, along with a new look at "Amazons" by Bill Paley. 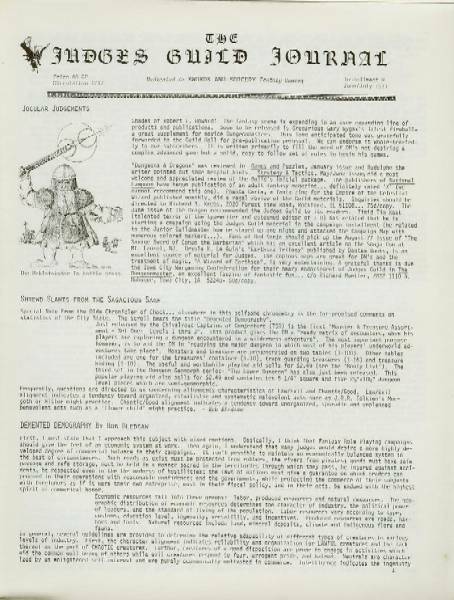 Also by Bill Paley are "A Trip to the Underworld, No.4" and several pages of useful "Rumors". Steve Marsh offers some advice with "Designing TSR Approved Products, A Few Unofficial Suggestions". Lewis Pulsipher presents an article on "War Robots". "Aha! Oho!" 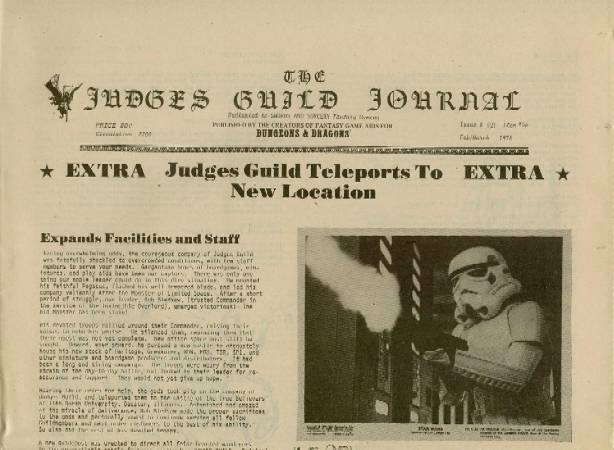 by Tom Jones takes another look at some of the questions about Star Wars. This time the "Monster Matrix" offers eight pages of strange creatures and unusual beasties. As usual, the "Booty Bag" is filled with a wide variety of wondrous magical treasures. The main feature is a 16-page pull-out adventure by Jeremy Fowler titled "Striek Hollous". Another item by Bill Paley is "Pilgrims". "Astrology and Astrologers" by Edward R.G.Mortimer looks at new NPCs. Rea Moorhead Pruehs talks about "Role Playing with Your Computer". "Descent into Darkness" is a computer moderated dungeon designed by Michael Mayeau. A 64-page magazine featuring Kevin Siembieda art on the front cover. Once again Bill Paley's material appears, this time as a short story titled "Sea Devils". In the area of game variants there is "The College Options for Traveller" by Charles M.Cook, as well as "Lycanthropy" by Geoffrey Tole, and "Martial Arts" by Jon Reinecke. Mike Billington brings up the point of Monster Intelligence in "The Amazine Dissappearing !". Tom Jones presents "Politics Intrigue Guidelines". 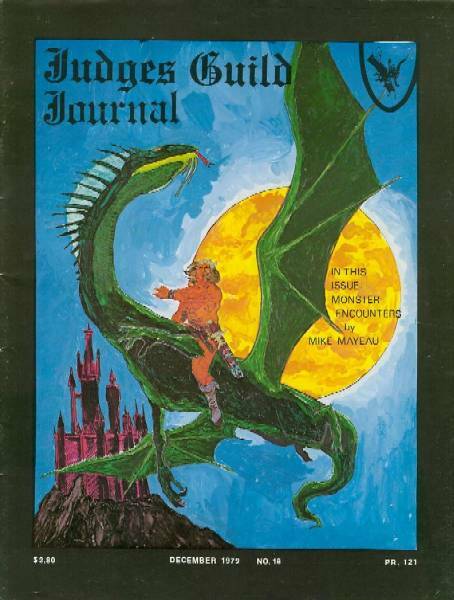 The pull-out adventure in this issue is "Shalizar's Tower" by David Dougher. Lewis Pulsipher discusses "The Essence of a Good Wargame", and Terrance Mikrut looks at "Shopping for Armor". 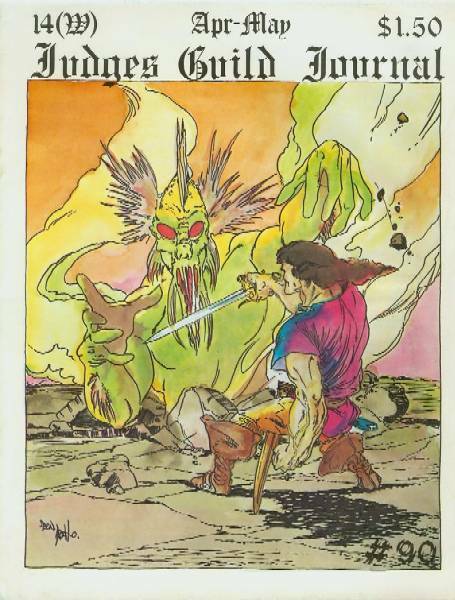 As an extra feature, there is a Role Playing mini-adventure by Kevin Garbelman titled "Harahalat the Dragon". Donald L.Spidell sends players on a lenghty trek "In the Tesseract". Illicit substance make an apearance in role-playing in Geoffrey O.Dale's "Some Words on Funny Chemicals". As usual, the Booty Bat and the Monster Matrix are filled with unique finds to spice up campaigns with.